The premier way to travel, discover luxury with each Azamara voyage from our Club World Owner's Suite, Club Ocean Suite, Club Continent Suite or Club Spa Suites. As a suite guest receive a variety of exclusive benefits in addition to modern accommodations and authentic service. We take care of all the details, so you can focus on the adventure ahead. 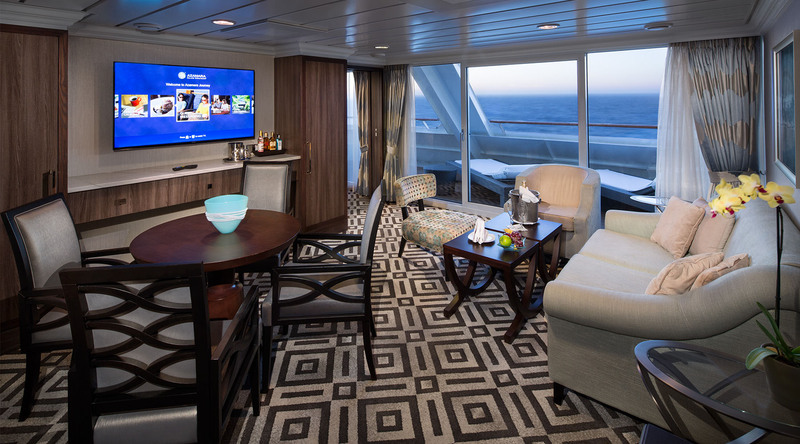 A boutique hotel at sea, each of our cruise suites offer the comforts of a five-star hotel suite with the added decadence of ocean views, sea breezes, and butler service. Relax with spa-like sea breezes, and butler service. Relax with spa-like amenities including plush cotton robes and slippers, French bath products, fresh flowers, and fine linens. Open the sliding glass doors to your private veranda and curl up with book, dine al fresco dining, or stargaze. Share a drink of your favorite spirit—on the house. And should you need anything, your English-trained butler is never more than a call away, ready to assist with reservations, private parties, dinners for two, and much more. Still Can't Decide on Upgrading to a Suite? Generous accommodations. Spacious living room. Expansive balcony. Your Azamara Suite is your luxurious retreat at sea with plenty of space for living and enjoying our unmatched amenities. Plan a party, entertain friends, or just put your feet up and relax. What you do with all of this extra space is up to you. Whatever you decide, we’ll help. Our butlers are remarkably adept at tending to the details that make you relaxed and happy. Think of your butler as your personal valet, party consultant and planner, wine expert, mixologist, afternoon purveyor of fabulous treats, reservations specialist, and all-purpose support system.